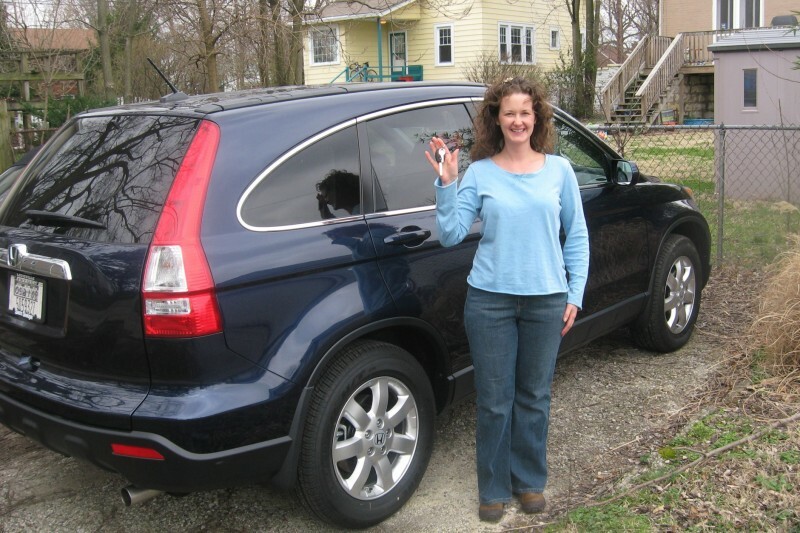 A nostalgia photo: me with the keys to the only car I’ve ever chosen for myself, March 2008. It’s been an eventful week. Dorothy’s at a drama day camp, we had a nice visit from Aunt Stephanie, and, unfortunately, we had a car accident. Belle seems to like riding in the car so I’d taken her with me to pick Dorothy up from camp. We were almost home when the light turned green for me at an intersection and I drove forward. Unfortunately, Mr. Wears-the-Same-Color-as-His-Sports-Car-With-Vanity-Plates thought that his red stoplight did not apply to him and he zoomed through it–and right into my car. I honked/swerved/braked and all of that, but the impact (to my front passenger side) was still pretty fierce. My back got quite a jolt and the pup hit the floor. Thankfully, the kids seem to have come through the crash just fine, safely secured in their correctly-installed car seats and Worth still rear-facing. The pup picked herself back up with no ill effects, and I’m hoping my sore back is a temporary issue. My car, however, is not so fine. The impact sent us on a little half-spin that seems to have made one of my rear wheels tilt toward the center. Not good. I drove the vehicle the remaining blocks to my house at about 5 mph, with my father-in-law carefully following behind, but the conditions deteriorated such over the course of the short drive home that I’m quite worried about what’s going to happen to my beloved car. It shakes and trembles, screeches and takes jolty little nose-dives to the left without any input from the driver. I’m trying to remember how grateful I am that all my humans (and one canine) are still in one piece, but I’m also pretty upset about the car. My mother has been sweet to loan me hers until we can come up with a better interim solution, but it’s a lousy feeling to be without my wheels. My car has the hitch, so there will be no camper-towing for a while. I’m also almost ridiculously fond of my car (I get gently made fun of for this sometimes) and it makes me sad to be without it. My car is just such a great fit for my life–there is a perfect spot or feature for all of my little people, gadgets, or travel-related needs. It’s not too big and not too small. Up off the ground but not towering. I spent many hours researching and reviewing cars after my old Civic was crashed (along with, unfortunately, my right arm) back in Dorothy’s infancy, and I’ve always felt that though nothing can make up for a right arm that never got back full range of motion and always knows when it rains, getting to pick just the right vehicle for me while my husband was still in law school was a nice consolation prize. My fingers are crossed that the damage isn’t as bad as it seems, and that maybe I’ll be back on my own wheels soon. Ok, enough of my whining. Belle needed a special comfy place and I’ve made her a dog bed. 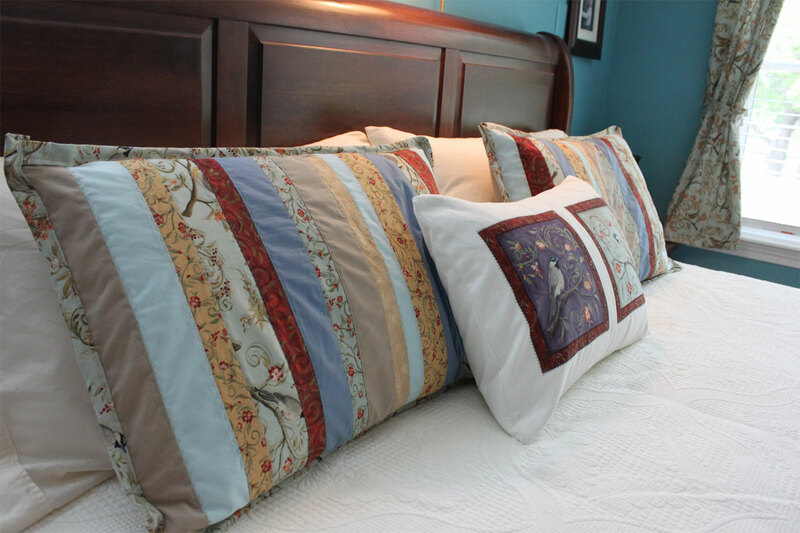 I used two standard-size pillows that I hooked together with snaps along one long side of each. This way the pillows can be detached for easy machine-washing. Otherwise I think a well-padded dog bed for a pooch the size that Belle will be would not fit in the washing machine. The bed is located in the hallway right outside the bedrooms of our human family members. 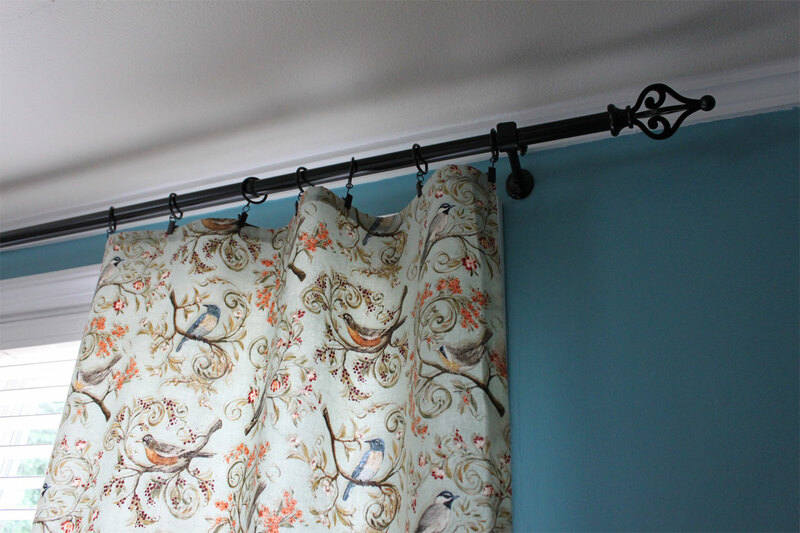 I used leftover bird fabric from the curtains in my bedroom, machine basted to an old flannel sheet for added body and sturdiness. The bottom is just cut from a thrifted sheet, with overlapping edges for easy removal. Belle seemed to know exactly who the bed was for and plopped right down. 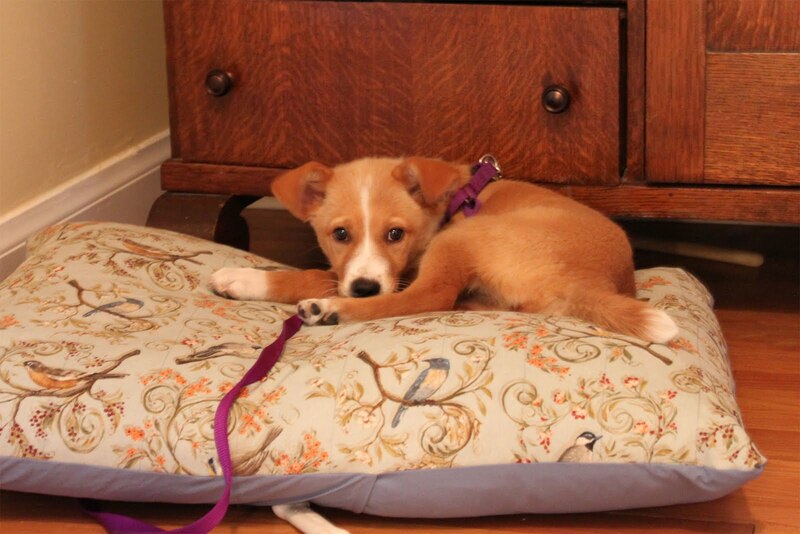 I’ll have to take regular photos of her on it as she grows, to record her growth as her puppyhood speeds by. She’s a sweet little dog. 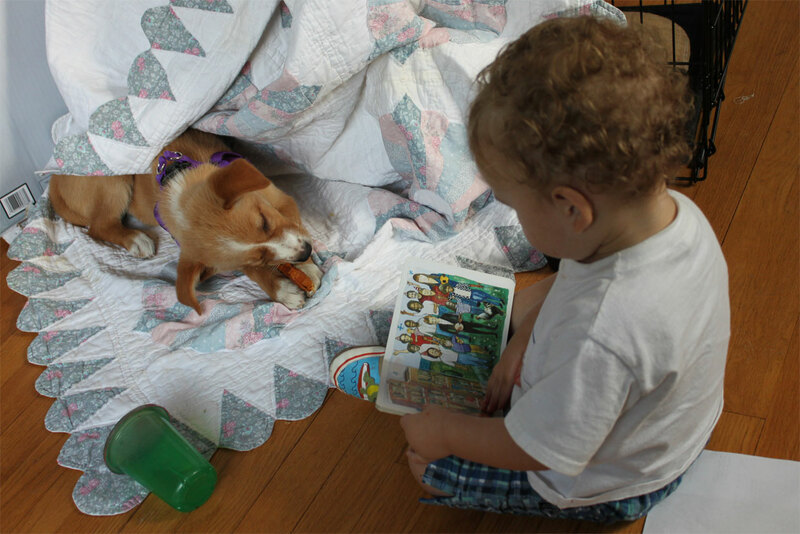 I’ve been reading up on puppy training since we’re such dog novices. I love this book, written by a group of Eastern Orthodox monks who raise and train dogs to support their community. I hadn’t expected to enjoy reading about puppy training, but was pleasantly surprised when I fell quite engrossed by this bit of puppy prose. They take their dogs very seriously–I sometimes wonder if some of their very serious anecdotes and advice are a bit tongue-in-cheek?–and present all of their information and recommendations thoughtfully and thoroughly. I recommend it to anyone sharing a home with a puppy. Well, we’ve had some puppy-related drama since my last post. Poor pup got pathetically sick and I took her in for care on Sunday morning. She was admitted to the animal hospital for IV fluids and medication, where she stayed for two days. She’s recovering nicely and seems fine now, but our finances might not be. Let’s just say I could have purchased several new sewing machines for the amount we’ve now spent on this Humane Society animal. I hope she gets how lucky she is. 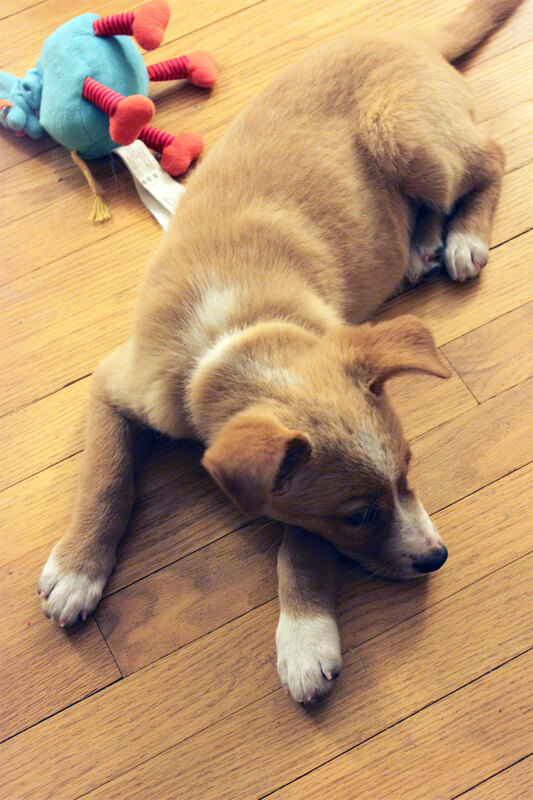 We’re growing attached to this pup but haven’t settled on a name. I created a poll. Want to help? We’ve been over-thinking this for months. 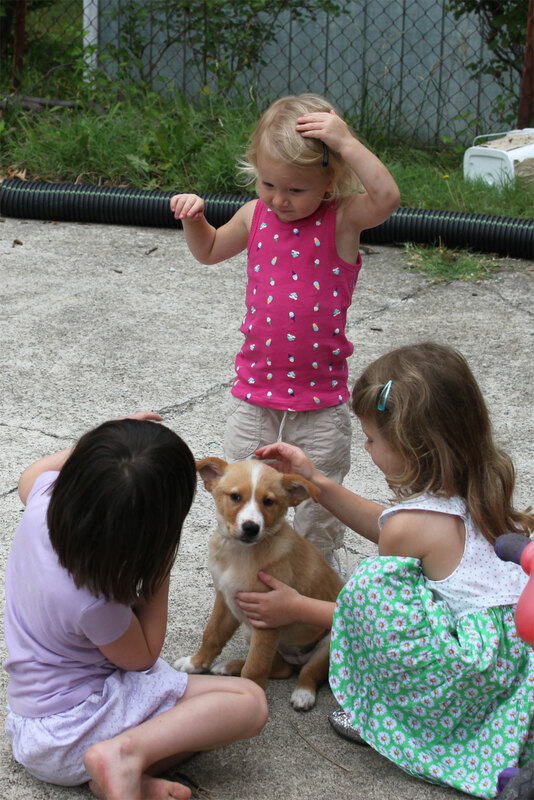 Decided not to, absolutely not, and if we did get one it would be a grown dog, but then somehow we ended up with this. A puppy! 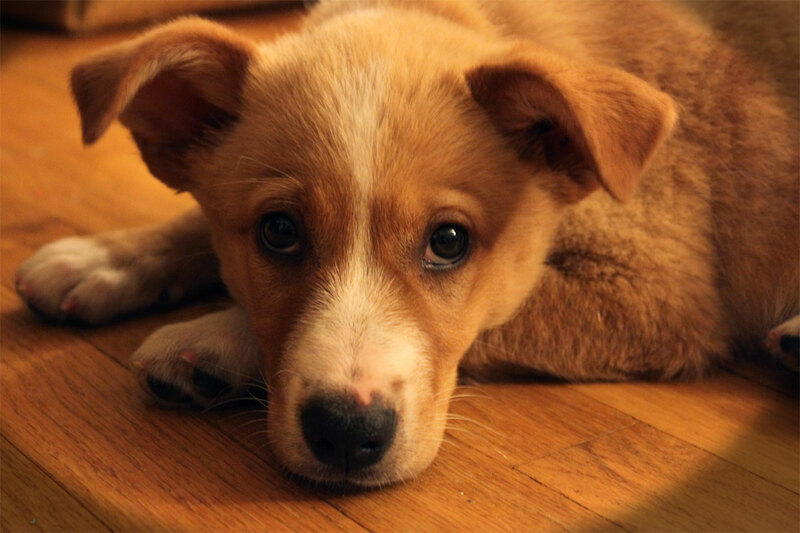 She’s two months old, and is, as the Humane Society put it, a “mix.” She’s adorable. I’ve never raised a dog before…wish me luck! We’ve been running around like crazy in this heat. If the rest of the summer’s schedule looks like this I’m going to have to figure out a way to “quit” and homeschool summer too. We’re always on the run! 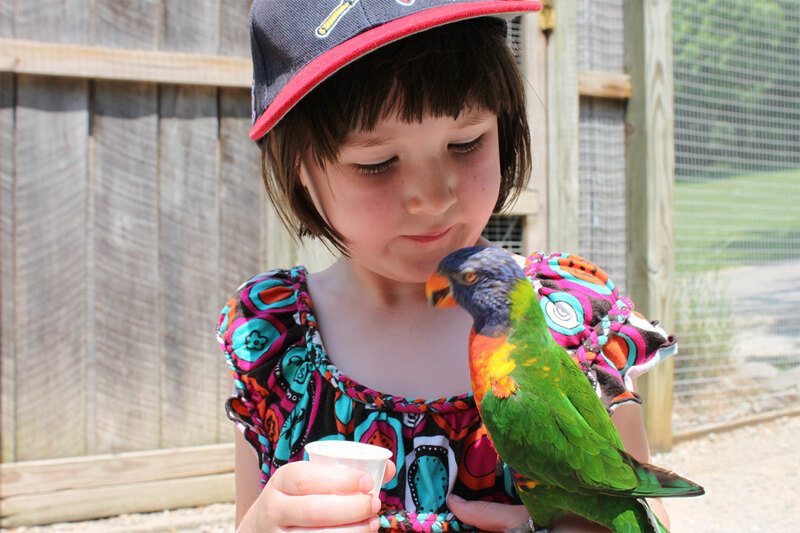 Splash parks, playgrounds, pools, berry patches and playdates–we need to slow down before we break down. Individually it’s all fun, but it adds up to a wee bit much. 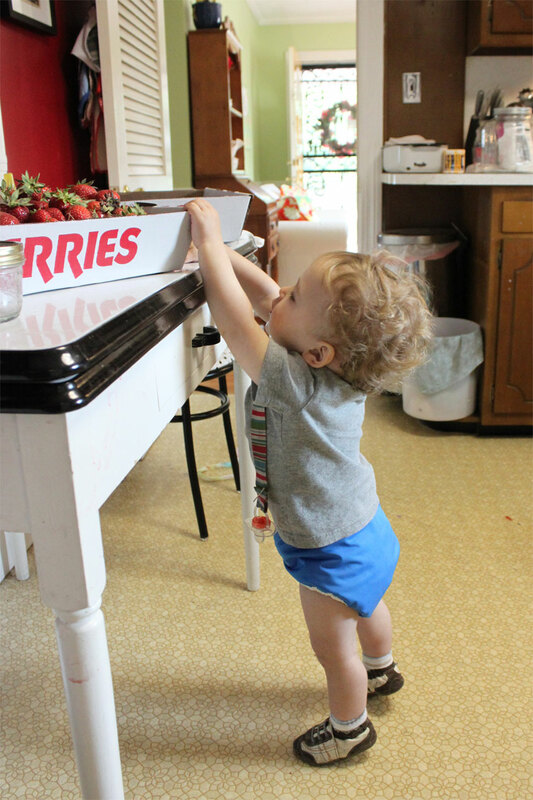 Here’s a photo of my little guy trying to swipe strawberries after our recent berry-picking excursion. I made the mistake of letting Dorothy use her own tray, and I had no idea how many she’d pick. I ended up with two gallons of strawberries–about twice as many as I’d planned on. I made strawberry-mango jam, cooked strawberry pie, uncooked strawberry pie, pie filling for the freezer, strawberry ice cream, strawberry daiquiris, daiquiris for the freezer, strawberry bread, bread for the freezer, and we ate huge amounts of strawberries and cream. Enough! Enough! Like our recent schedule of fun, the berries were wonderful but too abundant. Stir flour with soda and salt together with a fork. Set aside. Cream butter and sugar in a mixer bowl, then add egg, vanilla and bourbon. Add flour mixture and stir until smooth. Stir in chocolate and walnuts. 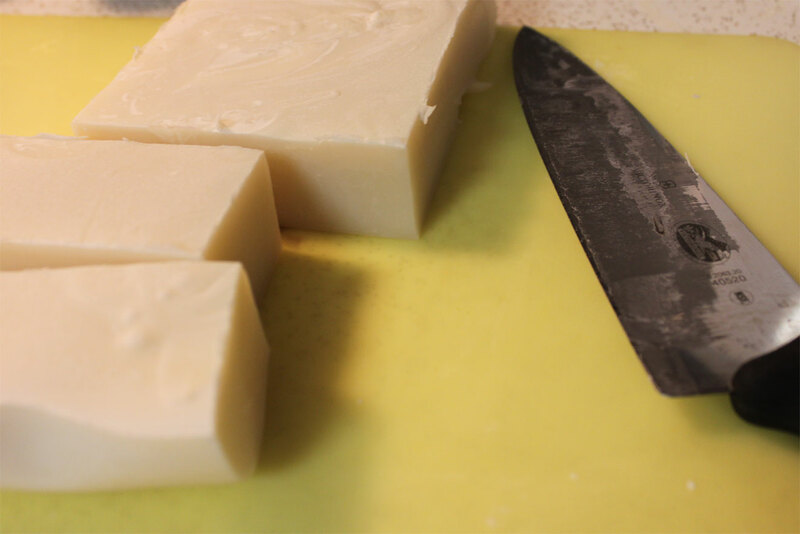 Drop onto parchment-lined cookie sheets and bake at 375 for 8-10 minutes or until done. 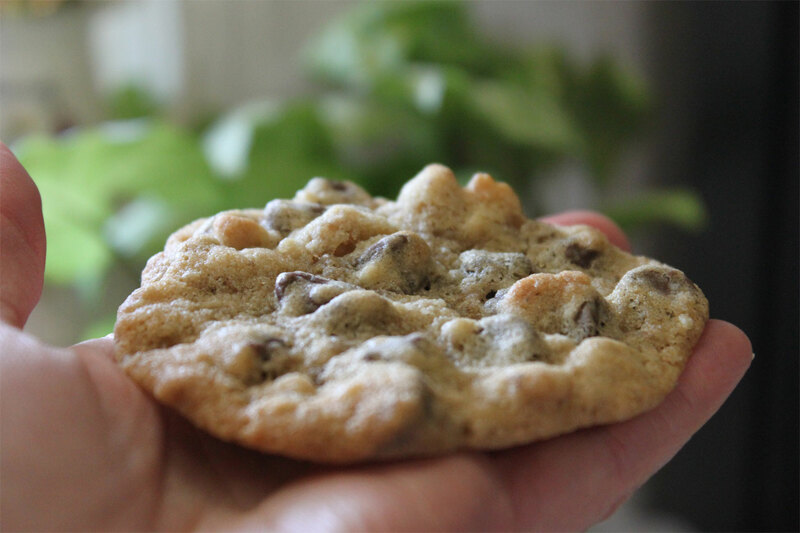 Leave ample space between cookies because they spread a lot. I finally took some photos of our nearly-completed bedroom. The only work left in here is to paint the ceiling and trim. The photo above is the master bedroom before we moved in. 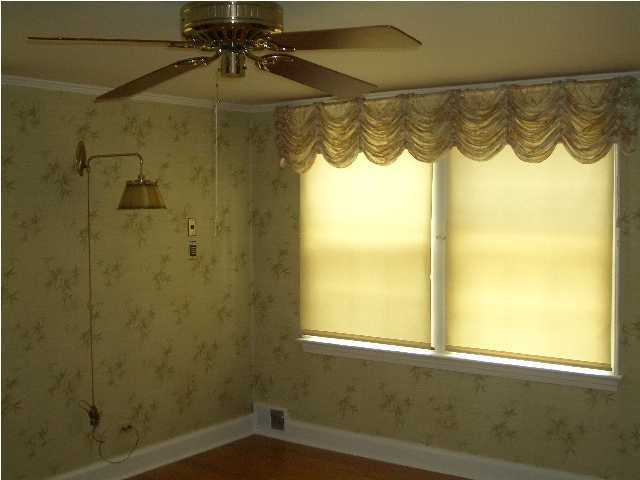 Those dusty old valances are making me itch just looking at the photo! We had intended to paint this room a sort of soothing neutral color, but when we stripped away the wallpaper we found a wall that had been a light turquoise. We liked it so well we ended up changing our color plans and painting the walls a deep turquoise instead, inspired by the color that had been on the wall in some previous incarnation. I used fabric from Joann for the curtains and pillows in here, Legacy Studio’s Nestled in Branches. I fell in love with this fabric when we were house-hunting, and once it finally came time to work on our new bedroom I was relieved that they still carried the prints. I bought the whole bolt of the curtain fabric! I still have some left and will probably do a small lap-quilt down the road. I did the pillow shams (as well as a slightly different alternate set so one can be in the laundry, not pictured) in strips of the bird fabrics with some solids as accents. I used a decorative stitch along each seam and binding along the edges. Once they were done I felt like I’d taken what could have been a very simple project (shams made of two pieces of fabric stitched along three sides) and made it needlessly complicated, but I really do like the final product. I also shouldn’t discount the enjoyment I got out of stitching the strips! Life’s about the journey, right? The whimsical bird print against my new white blinds and the new black curtain hardware makes me happy. 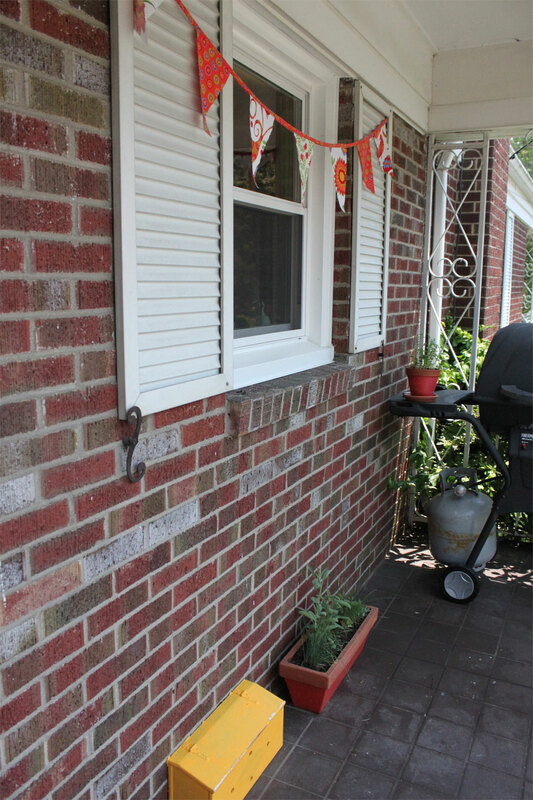 Those windows wanted to be free of the dusty, stuffy old curtains that must have looked fresh and pretty when they were new, but had long since outlived their moment. Waking up in this room is wonderful! 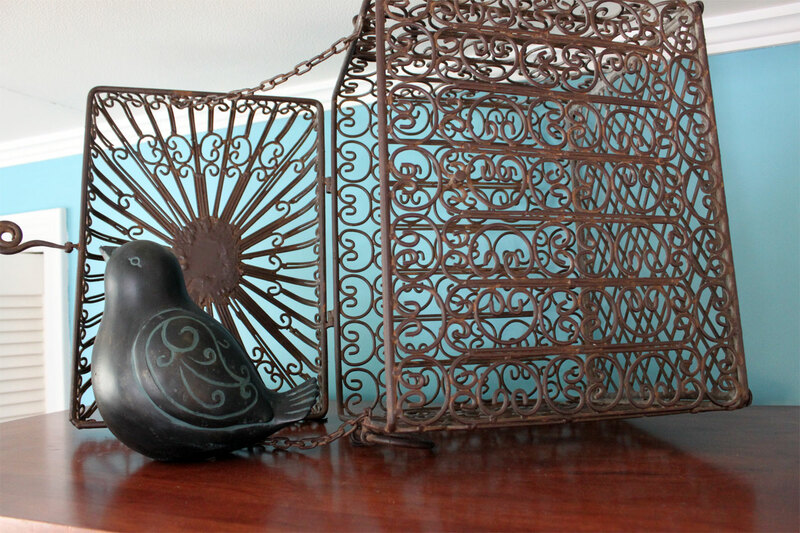 I needed something on top of our wardrobe, so I combined a metal basket from my mother-in-law’s yard sale with a bird intended as yard art to complete our free bird (ha ha) theme in this room. And this wasn’t really intentional, but seemed serendipitous. 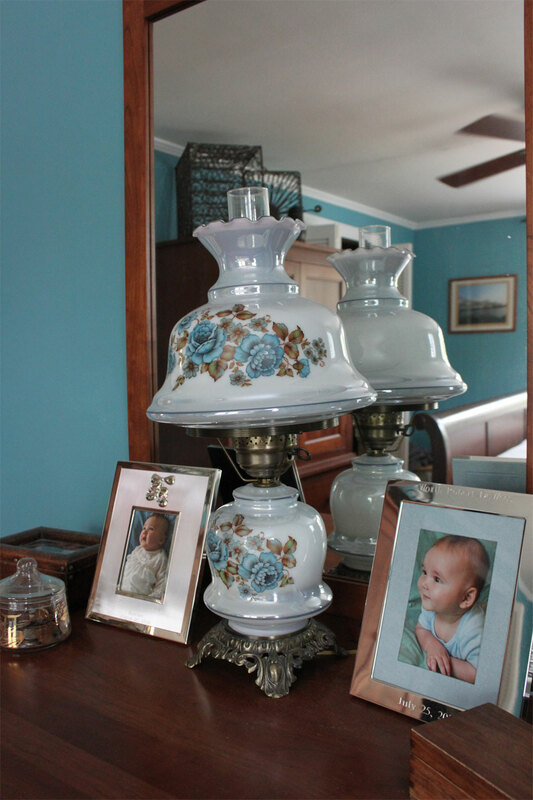 My grandmother’s lamp looked great in the living room of my old house but was having trouble fitting in to any of the spaces we were creating here. Now that everything is put together it looks like I actually created a room just for this lamp. I don’t get much into emotional attachment to objects, but it is nice when an object I love in its own right, like this lamp, also shares with me the memory of my grandparents’ living room where it shed light on many family moments over many years. My paternal grandparents died during my two pregnancies (Grandpa during Dorothy’s, Grandma during Worth’s), and now their lamp shines on the baptism portraits of my beautiful kids. I think they would have liked that.